Clare is an Italian Saint and one of the first followers of St Francis of Assisi. 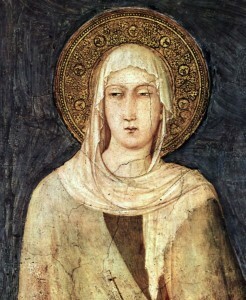 Clare was the third of five children born to a well to do family of Assisi. As a young woman she was noted for her goodness, docility to her parents, generosity and compassion for the poor and her dedication to daily prayer. On meeting St Francis she too was drawn to give her heart totally to the Lord and to follow the gospel way of life. She founded the order of Poor Ladies, a monastic religious community of women in the Franciscan tradition and wrote a Rule of Life – the first monastic rule known to have been written by a woman! 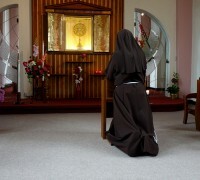 Following her death, the order she had founded was renamed in her honor as the order of St.Clare, referred to today as the Poor Clares.